Image caption Ray Jones's family said she had always been their "rock"
A driver who killed a motorbike passenger after crossing a lane without looking has been jailed for four years. John Morgan from Blaenavon, Torfaen, caused the bike to crash into his Volvo C70 after leaving a petrol station near his home in September 2016. 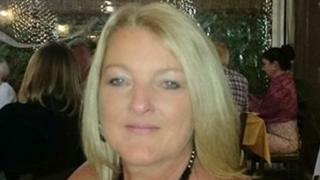 Ray Jones, 50, who was riding on the back of a Kawasaki motorbike with her husband Brian, 49, died in the crash. Morgan, 47, had denied causing death by dangerous driving but changed his plea during a trial at Cardiff Crown Court. Prosecutor Janet McDonald said: "By failing to stop and failing to look, that creates an obvious risk as he is driving into the path of an oncoming vehicle." Mr Jones escaped with minor injuries after the crash. Mrs Jones's family said: "Since the incident last September, John Morgan, known as Mark Morgan has caused significant heartache to our family. "Not only has he caused the death of our beautiful Ray, he has dragged us through court and showed no remorse whatsoever until the final moments of the trial." Morgan broke down during the trial, saying: "I will be honest with you, I didn't see the motorbike until I was out on the road. "I accept 100% that I should have brought that car to a stop but it was through human complacency and not wanton intent that I made an error." In a statement, Mrs Jones's daughter Katie said: "All our lives are ruined forever and this person gets to breathe and live another day, gets to see his family. It's not fair. "Our ray of sunshine is gone, stolen from us." Judge Tom Crowther said: "This is a family broken - time will be of some effect but like any fracture this will not heal without trace." He described the victim impact statements as "lacerating", jailed Morgan for four years and banned him from driving for six.